But first, we need some way to produce strips that will be equal in width, so that in the resulting grid-work of kumiko, all the pieces are flush front and back. 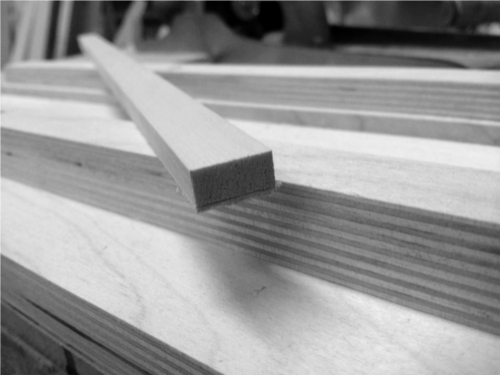 To accomplish this, we plane one face of each roughly-sawn length flat, then plane an adjacent edge square. 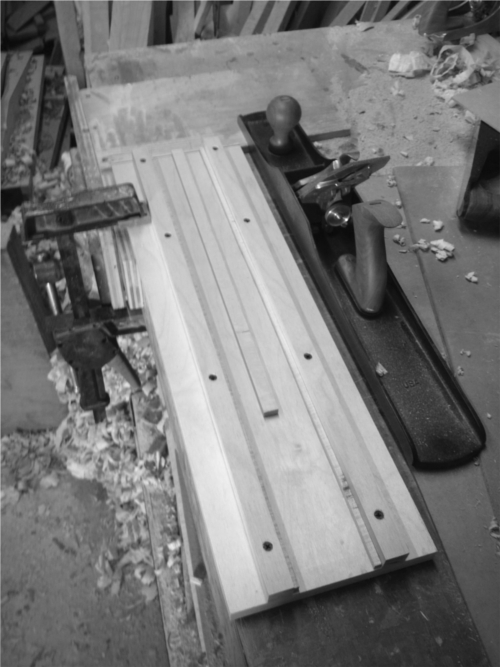 Using the flat face as a reference, we gauge our final thickness–in this case, 1/2″ inch–all the way around the piece, and plane the second face down to our gauged line. One edge is square to both faces. 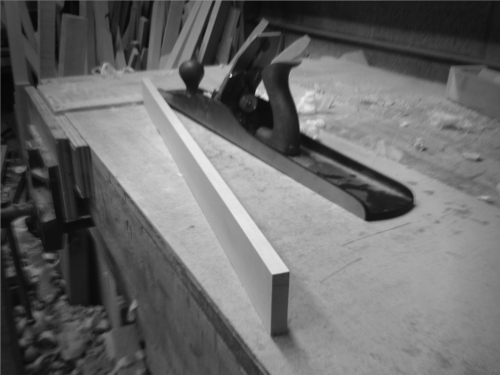 We mark the final thickness of our kumiko on the two faces, using the square edge as our reference point. We saw along this line, producing a slender strip, square and flat on three sides, having one wide, roughly sawn face. The rest of the original length remains, having two wide faces parallel to one another, but lacking an adjacent square edge. 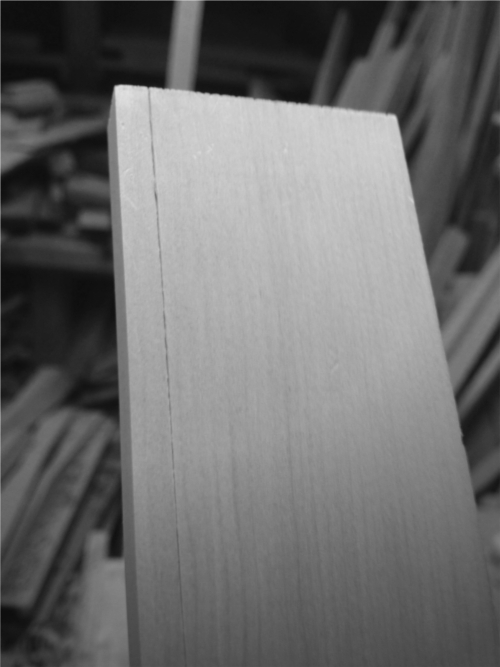 A new, square edge is planed, and the above process is repeated. One strip, flat on three sides, with square corners. 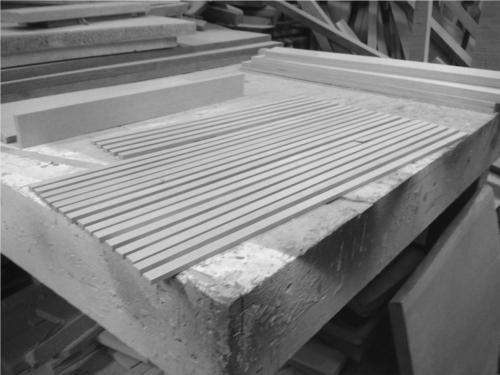 The bottom face still bears the rough marks of the saw, which will be removed when the strip is planed to final thickness. 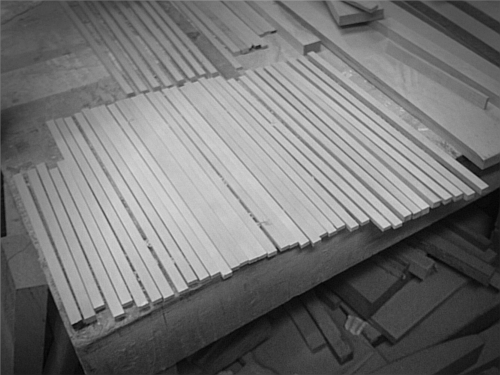 For the joints that connect all the kumiko in the final pattern to be clean and precise, it is imperative that the strips be of the same thickness. 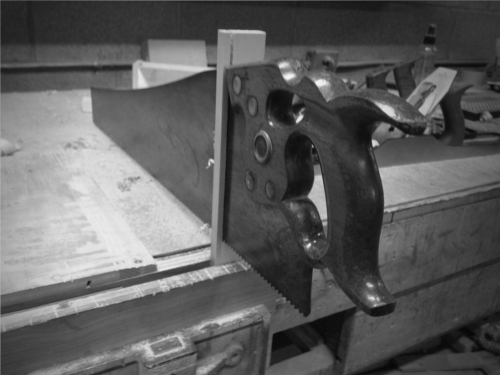 Special, Japanese planes with integral depth stops do exist, but a Western-style bench plane is adequate. I built a simple thicknessing jig that amounts to a track on which the plane may ride a given distance above the workpiece, which itself is held in place by a small stop at the end of the track. The thicknessing jig. The wider strips held by screws guide the plane, while the smaller strips inside hold the plane above the workpiece at the correct distance. Each strip is laid between the plane tracks, flat face down. Successive passes of the plane remove material until both sides of the plane’s sole encounter the tracks, preventing the blade from cutting any further. The result is a strip of cedar 1/2″ wide by two feet long, and, depending on which part of the pattern it is intended for, either 3/32″, 1/8″, or 3/16″ thick. 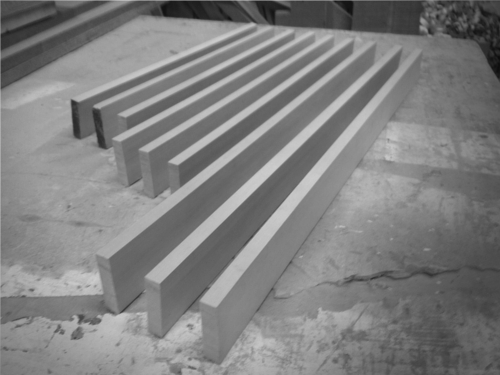 Finished strips, flat, straight, and square, and ready to be joined. 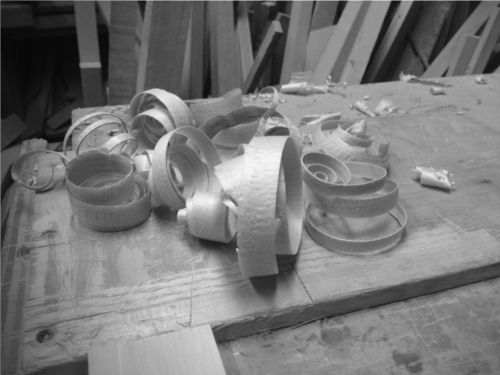 The next step is cutting joints to form the diamond-shaped groundwork, to be covered in the next kumiko post. Please leave any comments or questions–a lot has gone unsaid and unillustrated, and I’m happy to clear things up. Very cool Geremy. Most impressive.